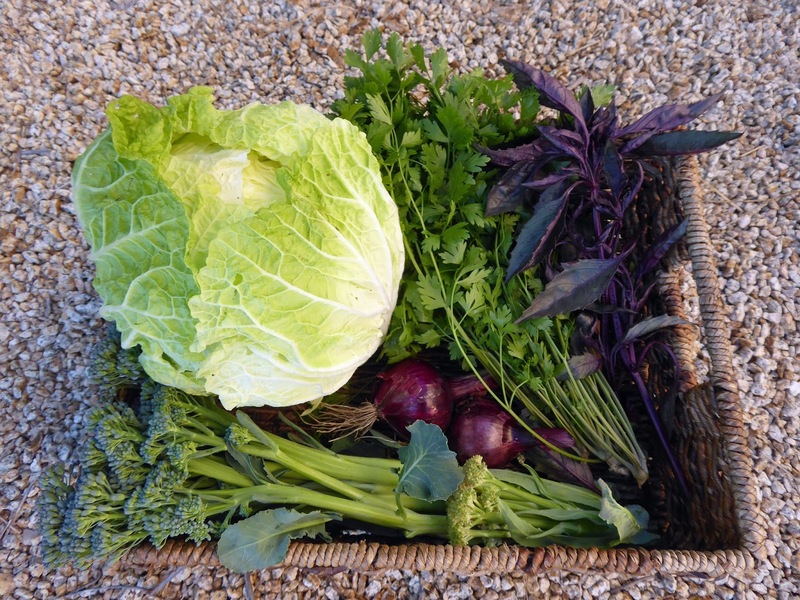 Spring harvests are pretty much over in the garden now and the summer ones are just getting started. 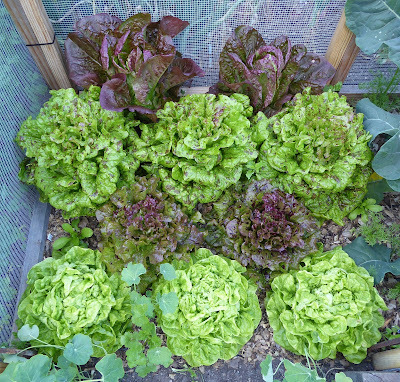 It will be some time though before the colorful summer veggies like tomatoes and peppers make an appearance. I harvested the final little head of stick cauliflower and most of the last of the Aspabroc shoots. 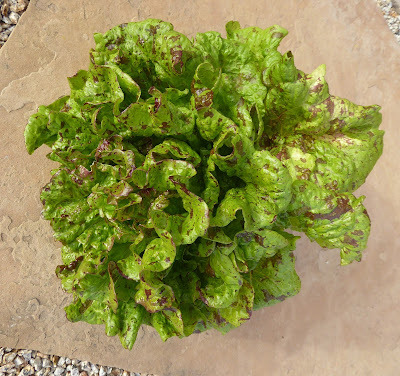 The final 2 heads of lettuce also had to be cut but escaped the camera. 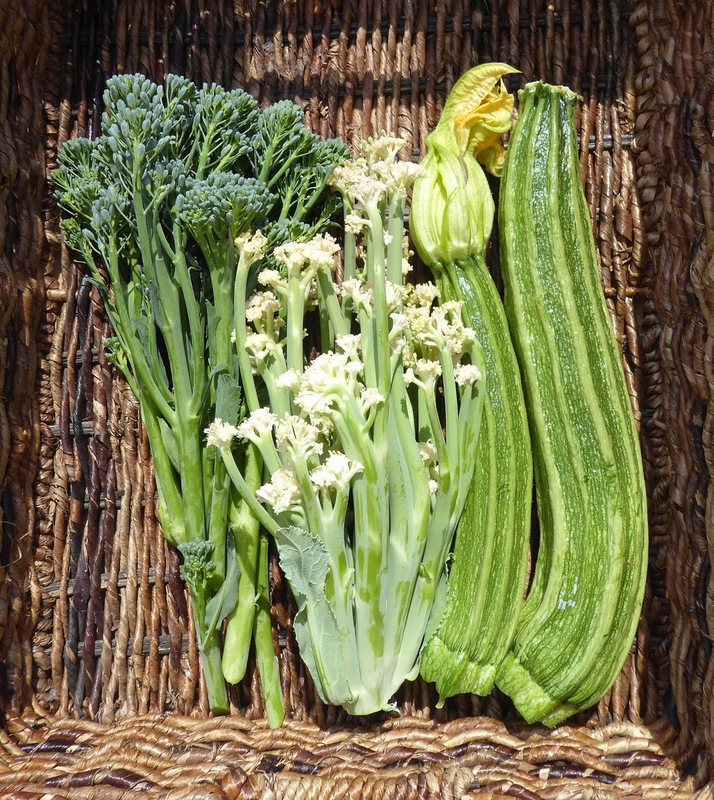 The annual zucchini glut is about to start - the always reliable Romanesco zucchini has started regular production. I'm going to have to pull out my trove of zucchini recipes. 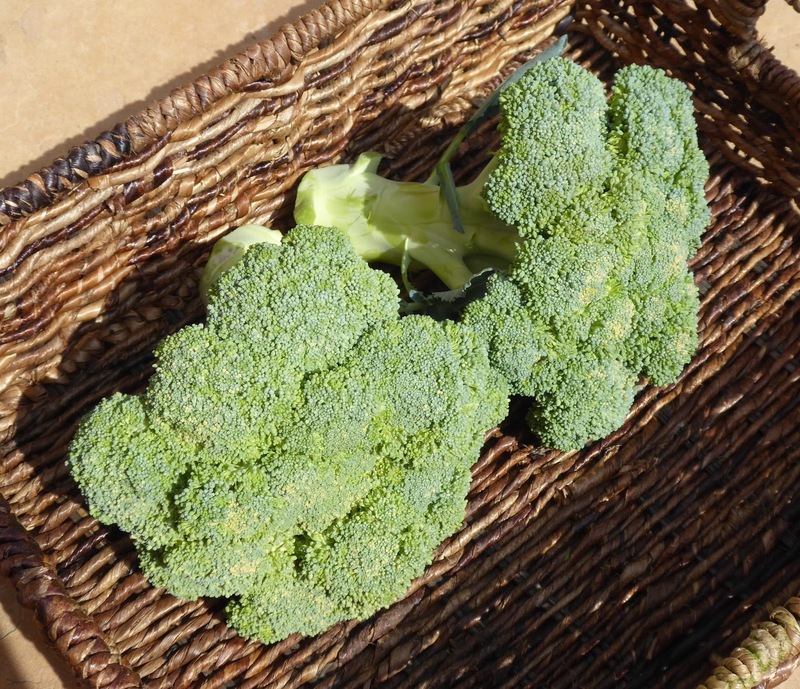 Broccoli is a year round producer in my mild climate and I harvested the first 2 main heads of spring sown Batavia. 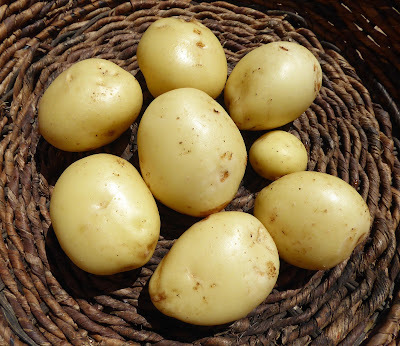 I dumped another 3 containers of Yellow Finn potatoes and added 3.5 more pounds to the total spud harvest. The latest harvests were prettier than the first but the yields varied quite a bit - 13.5, 18.7, and 23.7 per pot, each one started with one mini tuber. I only photographed the first 2 pots, but the third round looked much the same as these ones. 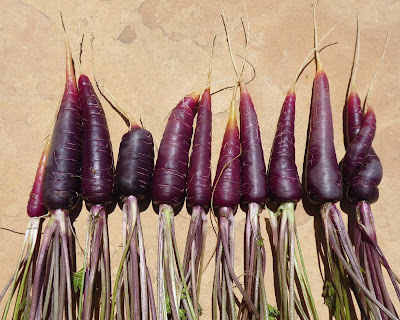 The last of the spring sown carrots had to be pulled to make way for melons and winter squash. The basils are growing like weeds now, they and the rest of the summer vegetables loved the heat wave that we recently experienced. 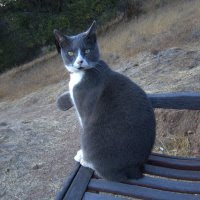 We escaped the worst of the heat here, the hottest it got here in my microclimate in the past week was 87ºF. The water in Monterey Bay and along the coast has been cold, in the low 50º's, and that cold water and accompanying fog has helped to keep the temperatures near the coast in a more comfortable range than what inland areas have had to endure. 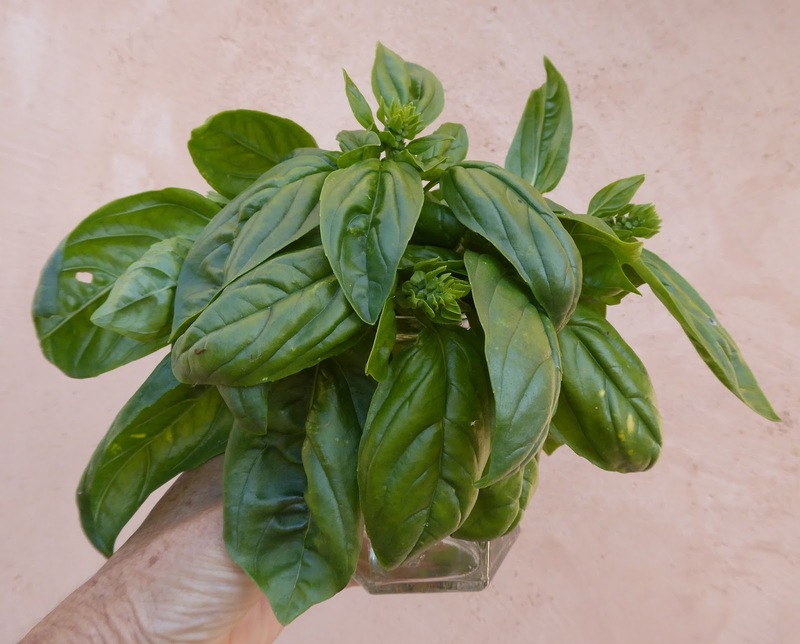 I like to cut bunches of basil and bring them into the kitchen so that I can use it frequently without having to run out to the garden. I put the cut stems into a container of water and drape a plastic bag over the bunch. It will stay fresh on the kitchen counter for days that way and if it sits long enough (rare) some of it may even root. One notable dish that I concocted last week was a sort of gazpacho that used up a half pound of the glut of lettuce that I harvested the previous week and some dried tomatoes and peppers from last year. It turned out better than expected and because I kept notes as I made it I was able to write up the recipe and post it on my recipe blog here. 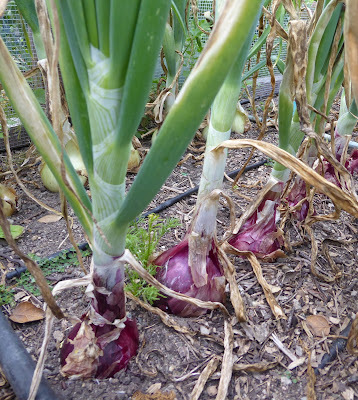 I've had some harvests that I've not bothered to photograph, they are so ugly and disappointing - onions. 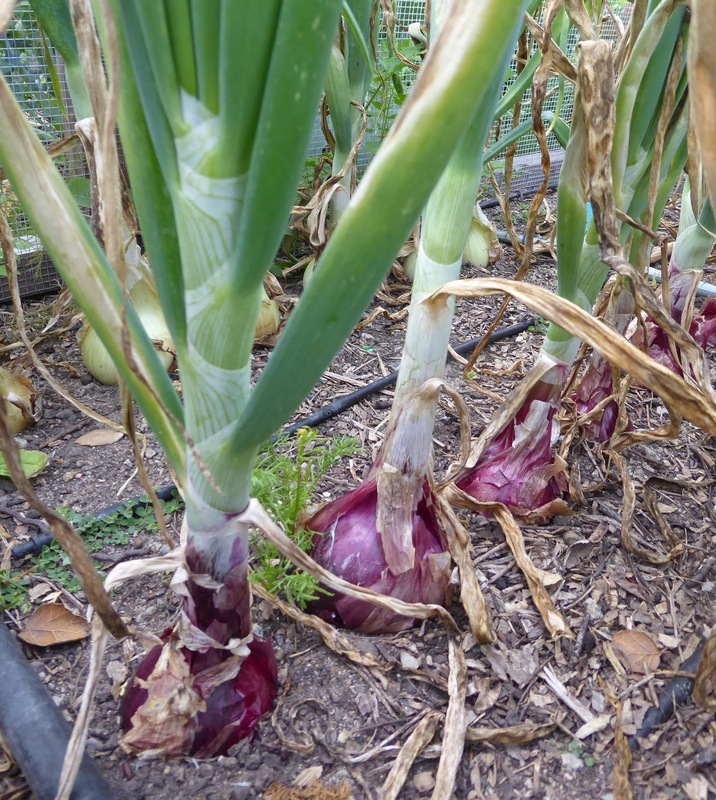 All of the onions are uniformly ugly and small, but they taste fine and one side effect of their suffering seems to be that they don't have the energy to bolt, I've not found one flower stalk in the patch yet. I am short on photos of my harvests this week. We've had a high pressure system settle comfortably over the state which is making it uncomfortably hot for me and the garden. I spent some time Saturday afternoon bouncing between the relative coolness of the house (we don't have a/c) and the heat in the garden rescuing cool weather loving veggies that were stressed out and/or trying to bolt. Those didn't get photographed because I was trying to get them indoors and into the fridge before they and I wilted. 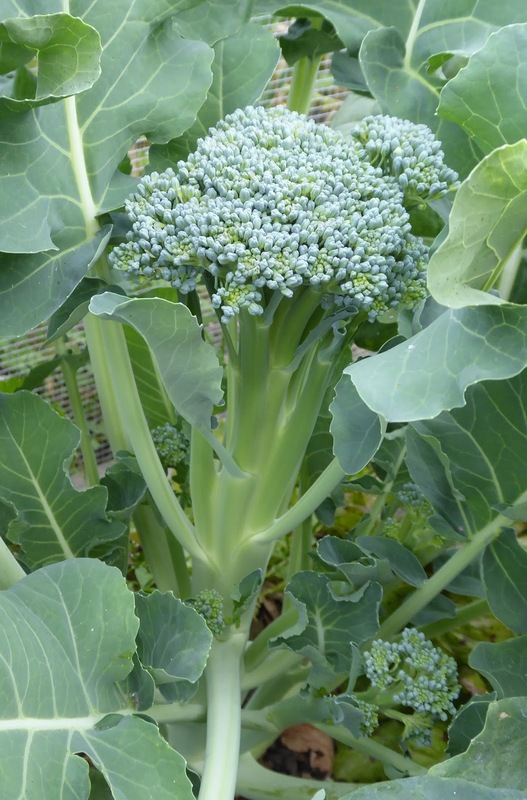 I hauled in 2 more heads of napa cabbage, 6 heads of lettuce, nearly a pound of Aspabroc (aka Broccolini), some Batavia broccoli shoots and the first Romanesco zucchini. Earlier in the week I cleared out a couple more varieties of carrots. 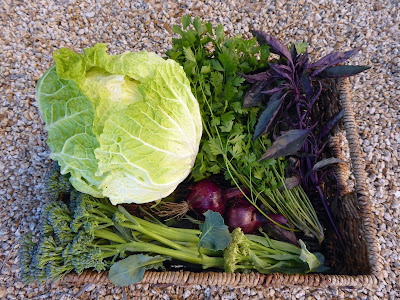 There's a basketful of veggies from earlier in the week before it got hot. Another Little Jade napa cabbage, some Aspabroc, a couple minuscule Fioretto Stick cauliflower, Cilician parsley, mini downy mildew stunted Red Candy Apple onions, and some very purple Corsican basil doing a good job of photobombing the shot. 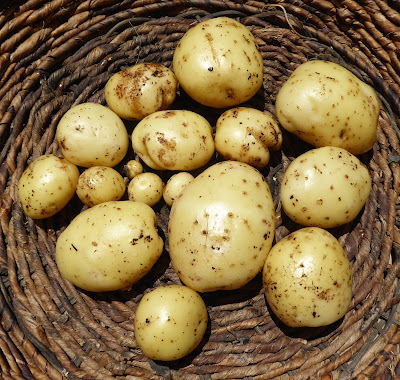 I dumped out the first pot of Yellow Finn potaotes to see what was going on. The certainly aren't beautiful and neither were they plentiful (only 1.5 pounds) but there were some decent sized ones that should make for a tasty Salad Nicoise tonight. Last week I cleared out some big bunches of mustard from the garden and decided to try a couple of preserving experiments with it. That bunch above was dipped in boiling salted water just long enough to wilt it, about 5 seconds, and then I chopped and dehydrated it. It is surprisingly delicious. 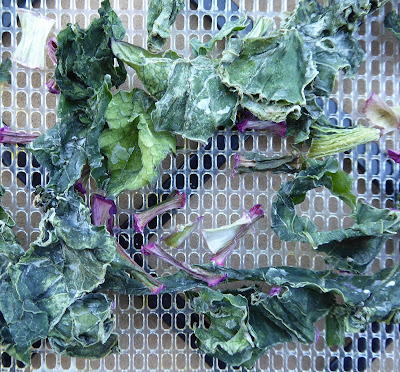 And then I read about a traditional Chinese method of preserving mustard greens, fermenting and drying. 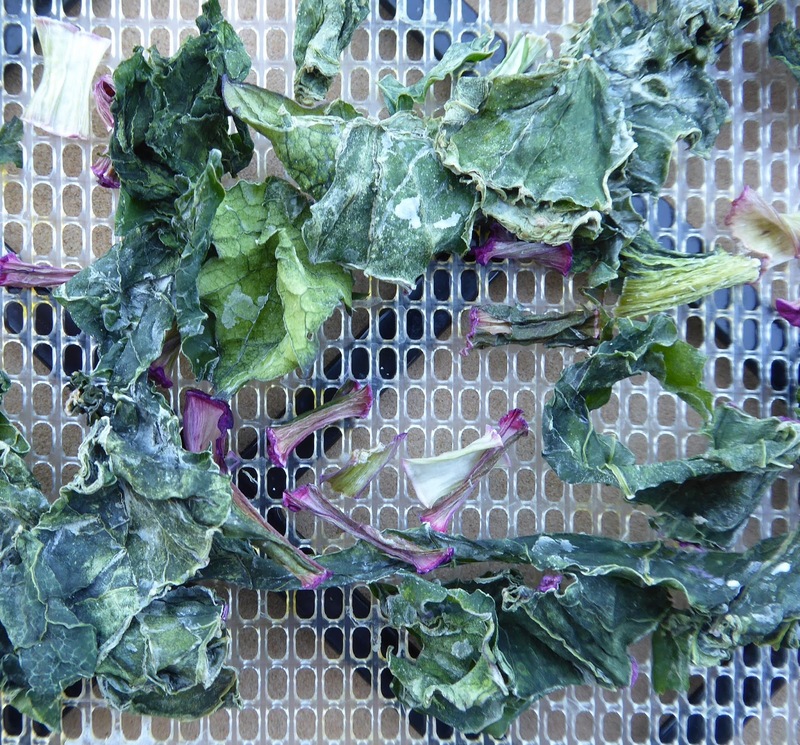 Actually the process traditionally involves first sun drying the greens to wilt them, then fermenting them, then sun drying again (I saw one description that also steamed them before the second drying). I followed a more modern recipe that used a dehydrator instead of the sun. That batch is just finishing up in the dehydrator now. One thing that I really do love about dehydrated foods is that they save a lot of space, 2 1/2 pounds of bulky mustard greens will fit into a pint jar once they are dried. The dried mustard greens will add a nice flavor boost to soups and stirfry dishes. Dave wanted me to be sure to mention a salad that I made this week that we both really enjoyed. I found the inspiration for it from a Mark Bittman recipe for a deconstructed Vietnamese Summer Roll turned into salad. I changed the proportions (less noodles, more lettuce), added chopped peanuts, and used a different sauce (also modified to be less sweet) for the dressing. It was a fantastic cool and refreshing dinner salad for a warm almost summer night. 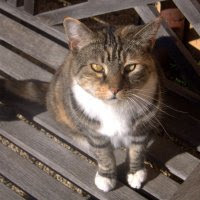 Now I've got to get outside before it gets too warm to get any work done. 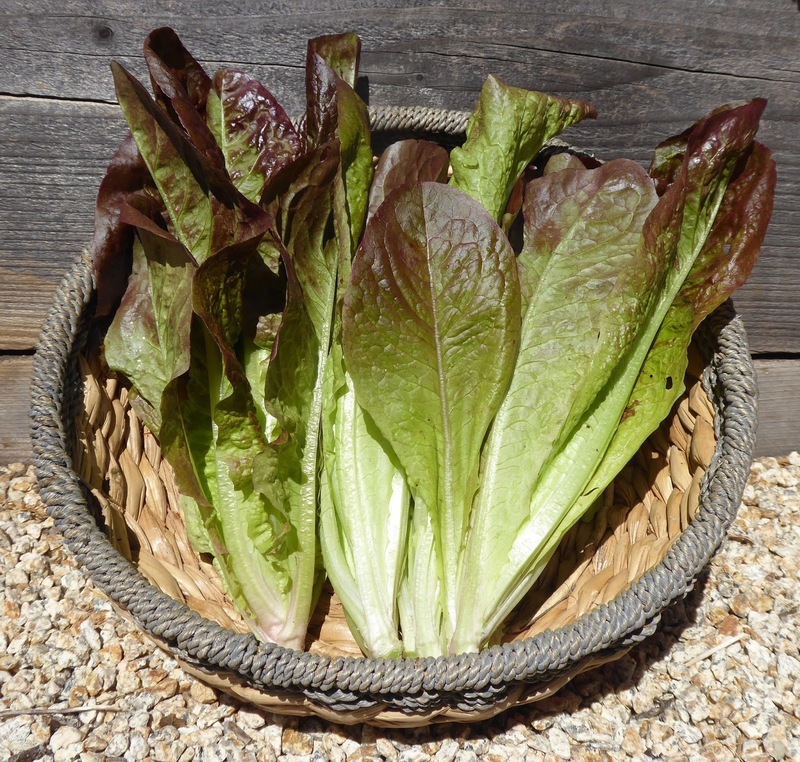 We have been eating a lot of salads lately and there's plenty more material coming in from the garden for many more. 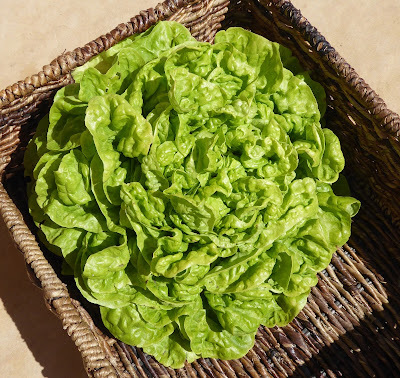 I'll start with Dave's favorite salad green of all - butterhead lettuce. That big beauty (over 1 pound) is big enough to make at least 2 good sized salads. It was the star in a salad last night that also featured a peach, grated carrot and radish, dried I'Itoi onion greens, Italian Mountain basil, and a vinaigrette made from Late Harvest Honey Viognier vinegar and EVOO. I particularly like the combination of peach, radish, and basil with the sweet-tart vinegar. 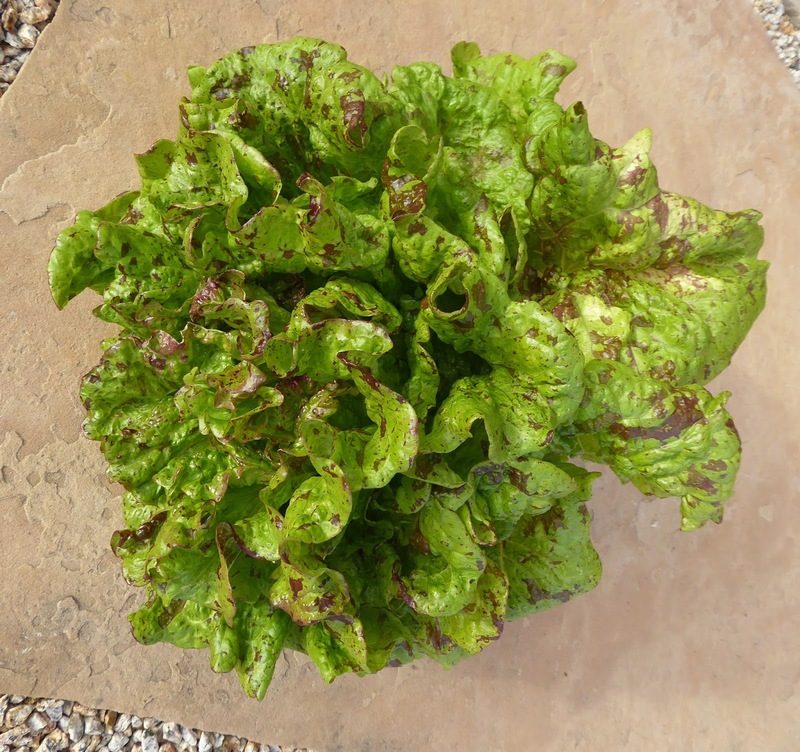 Another big head of lettuce from the garden last week was a full sized head of Joker Crisphead. I've already forgotten what I used to doll up the first salad from that head. 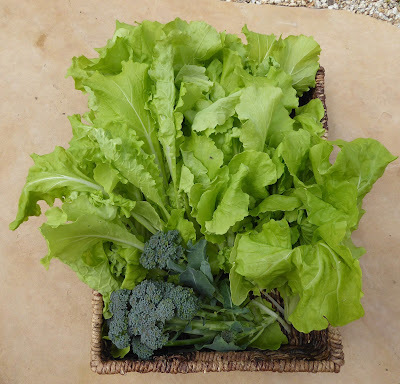 I had to harvest all of the cutting salad greens because they were already starting to bolt, although they did get to be good sized before doing so. 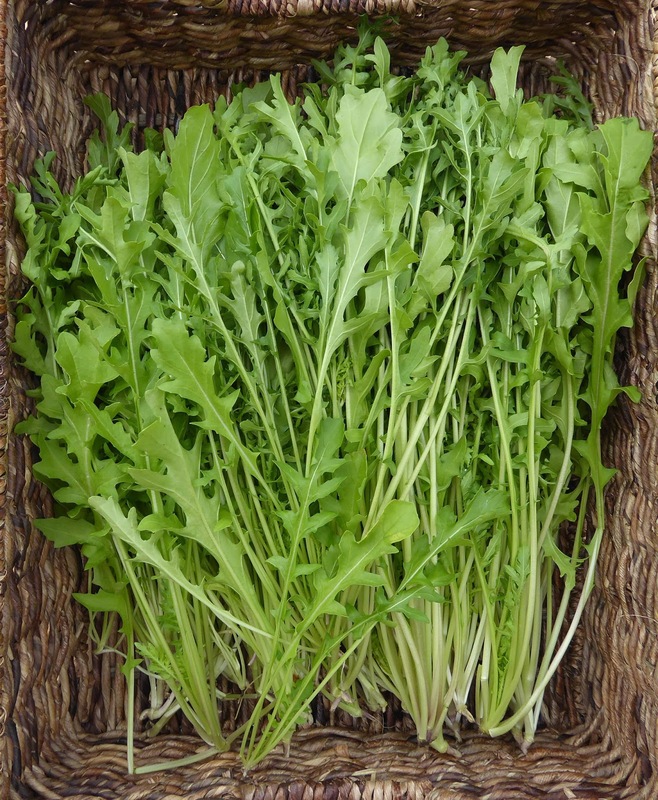 One of the things that I love about Speedy arugula is that it stays mild even when it bolts. 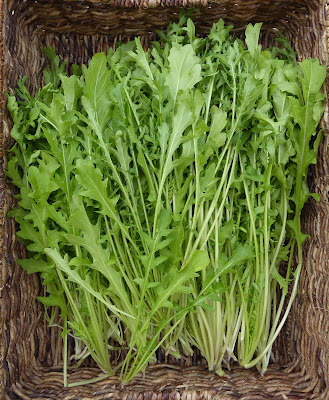 Dave doesn't like these "funny greens" so I enjoy these in big salads for my lunch on most days. 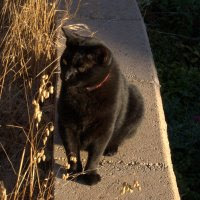 Mustard greens are another no-go for Dave, but I like their spicy bite, especially in soup. Lately I've been enjoying them in simple soups with either shrimp or sausage and Vietnamese rice noodles. I keep the seasonings simple - coconut milk, fish sauce, dried green onions, dried brown mushrooms, basil, and toasted sesame oil. 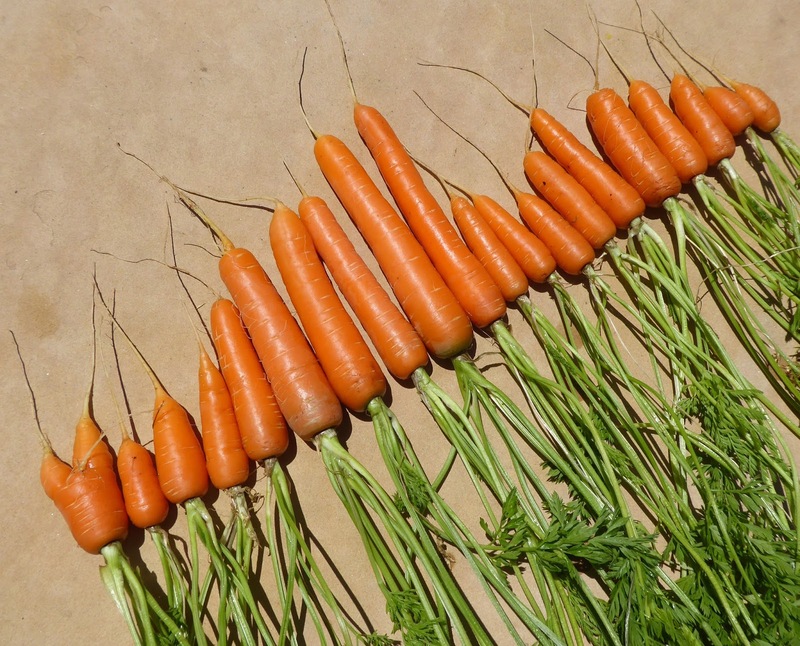 Many of the spring sown carrots have fattened up and are ready to pull. Rotild has done well for me as an overwintered carrot and as a spring carrot. 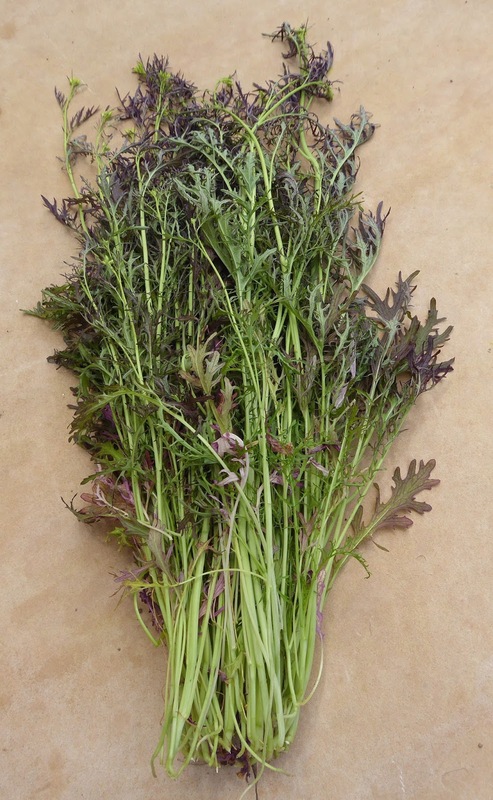 It has a nice sweet crunch and generally produces a nice clean root. That's the last of the Black Nebula carrots. 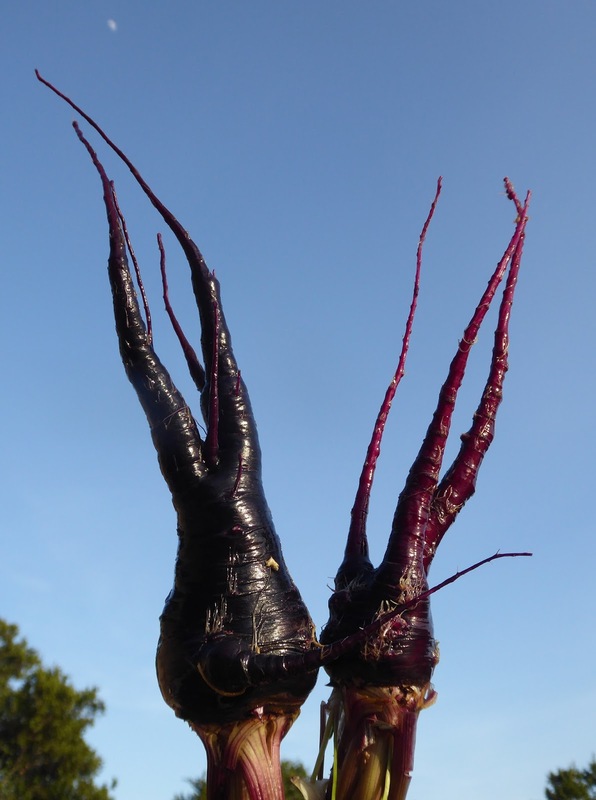 They have a strong tendency to fork and the roots get to be quite hairy - I gave those a shave before putting them in front of the camera. 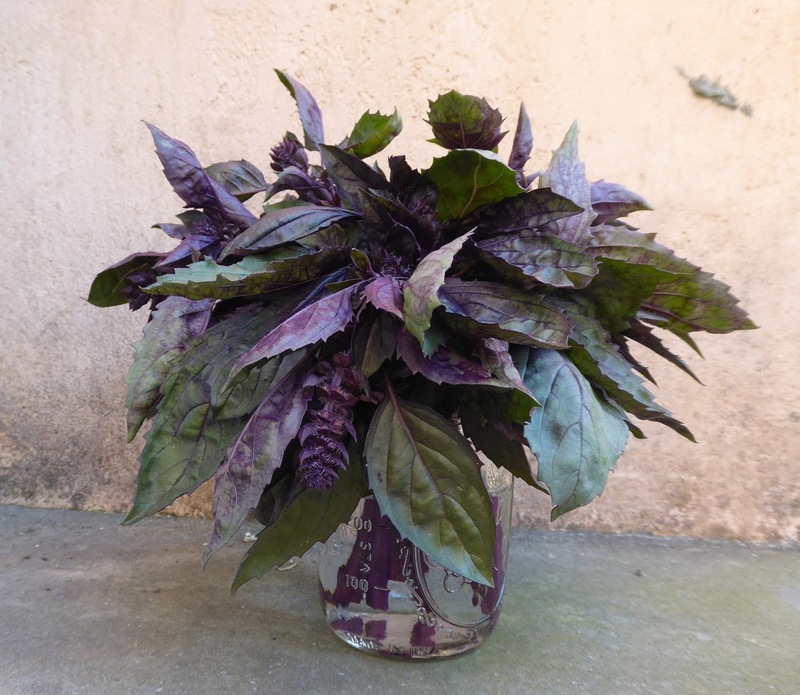 Some of them get some nice purple coloring in their foliage as well as you can see below. 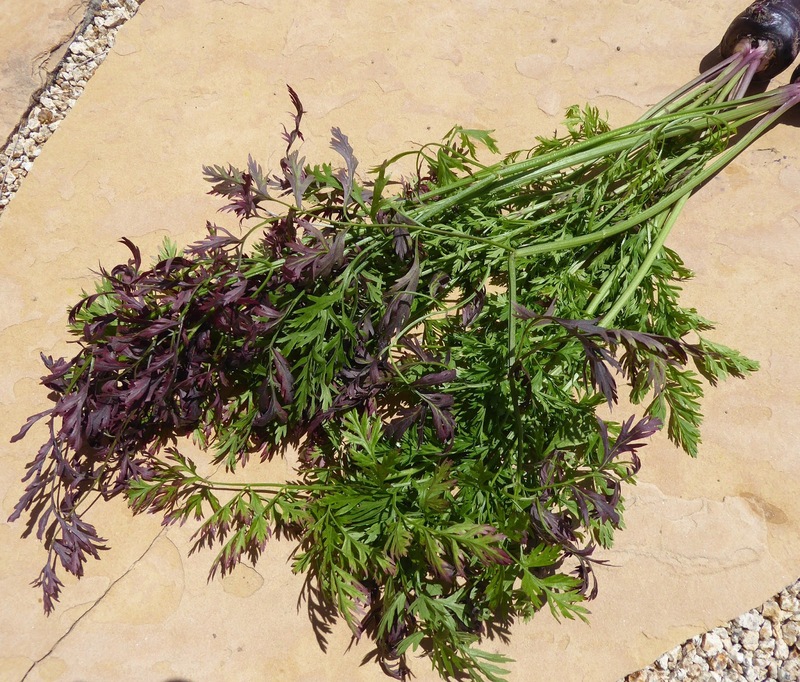 There were a few other harvests that I didn't photograph. 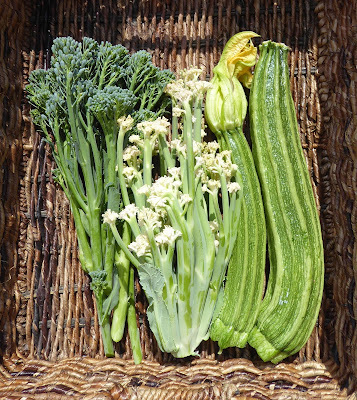 I cut down the last of the Mizunarubasoi to make room for the spreading Romanesco zucchini (which is sporting it's first blooming zucchini). 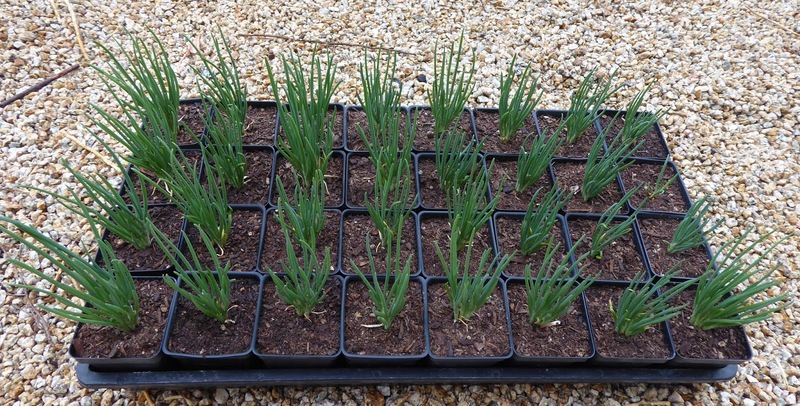 And some runty Yellow Granex and Top Keeper onions got rescued from the onion patch. 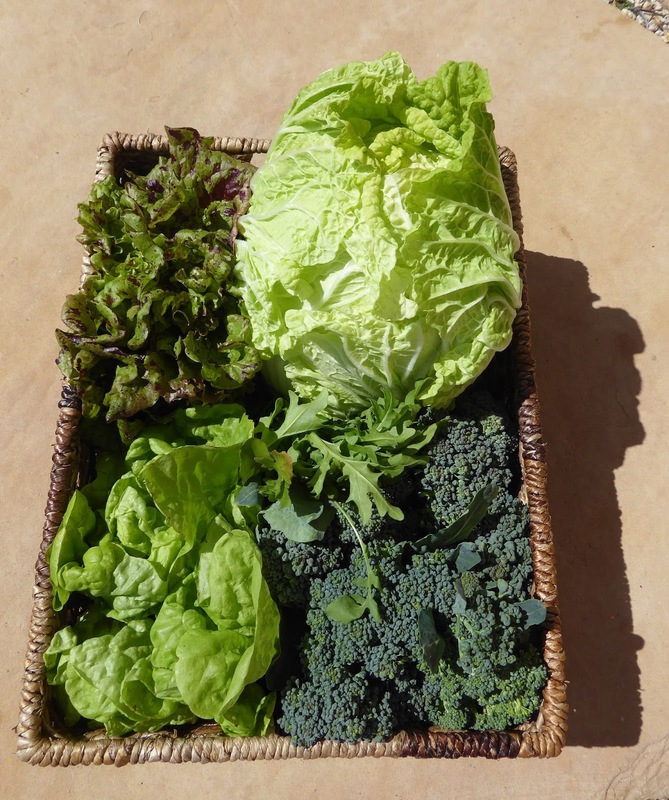 I'm not reporting harvest weights on my harvest posts these days, but if you are curious I've got a link at the top of my sidebar to a copy of a detailed spreadsheet that shows harvest totals monthly and to date for each veggie that I harvest. I update the spreadsheet every week or so, whenever I get around to it. I won't put a link here because it changes every time I update the sheet. A quick update on the garden. I've managed to get quite a bit done now that I'm over the worst of the cold (nearly 3 weeks and I'm still coughing though, this crud lingers). I got the tomato/pepper bed planted - 12 tomato plants, 11 varieties. 53 pepper plants, 22 varieties. The bed where the favas were growing is nearly ready for planting. I need to replace the drip lines because 4 years of hard well water has got many of the emitters clogged up or slowed to a trickle. I'll be planting mostly corn and beans in this bed. The first round of summer vegetables are growing quickly. The Tromba D'Albenga squash are already starting to reach for their trellis. You can see the Romanesco zucchini beyond starting to spread out. The cucumber babies are starting to take off. The sleeves protect the tender young seedlings from munching sow bugs and provide a bit of warmth. Three of those plants are survivor of my experiment with sowing pre-germinated seeds and the other three are from the backups that I sowed into pots. Birds got one seedling and the other two were weak. The basil plants are getting more bushy, and that's after I've harvested the central stems on each plant. The Aspabroc (aka Broccolini) is producing the first heads. 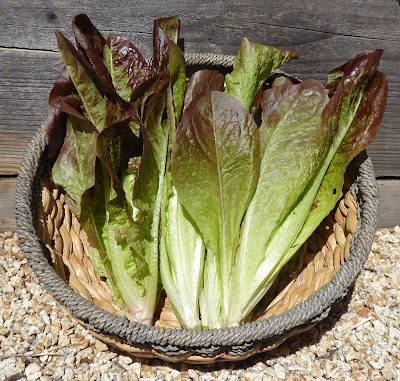 There will be some big heads of lettuce hitting the harvest basket in the next few days. On the other hand, the onions will be runts. You can see how bad the greens look, Downy Mildew really took its toll. 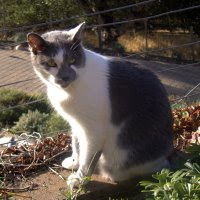 On the bright side, even though I lost all of the I'itoi onions in the garden I had some shriveled up bulbs left in my pantry and to my great delight every single bulb that I planted sprouted. These will not go into the garden, I'll be planting them in containers and will grow them far from the garden with its multitude of Downy Mildew spores. That's the latest, now I've got to get some more work done in the garden. 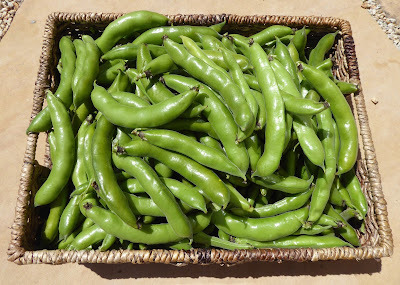 The last of the fava beans hit the harvest basket this weekend. I had to clear out the plants so that I could move the trellis to the new tomato and pepper bed. Dave was happy to hear that "we" passed the 100 pound mark with a final total of 112 pounds of beans in the pod. I'm glad he was happy, he had to peel almost every one of those beans. 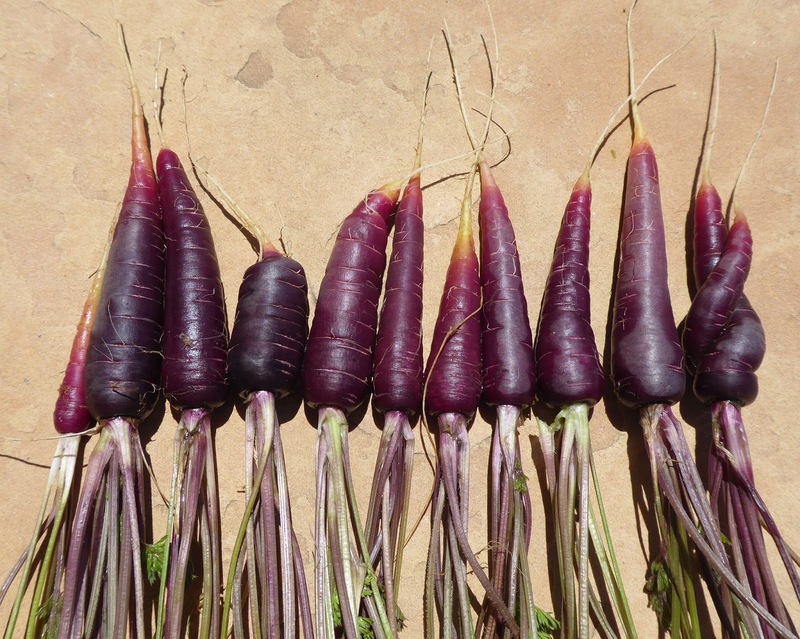 My favorite of the three varieties remains the Extra Precoce Violetto and it wins for 3 reasons. First it is early, the final harvest of mature beans coincided with the need to remove them so that I could move the trellis that I tie them up to. Robin Hood still had some immature beans but it started early and produced well so the last few immature beans weren't an issue. 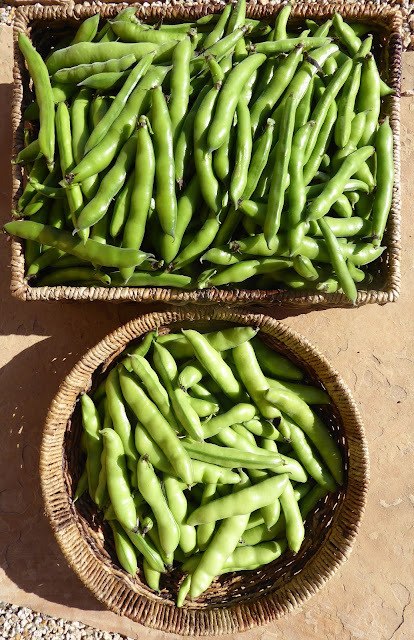 But I pulled a lot of beans off of the Aquadulce plants that needed at least another week to mature and they were later to start so it definitely impacted their overall production. The second reason is that the plants grow to a manageable size, as does Robin Hood, but the Aquadulce plants got to be over 5 feet tall. That's not a deal breaker but it isn't a positive trait. And third, the EPV beans themselves are relatively easy to deal with (for favas) having large pods with large beans that are easy to pop out, as does Aquadulce, but the Robin Hood beans are mostly small and the beans are tightly held within the pods making them more difficult to remove and the small size of the beans makes them more tedious to peel. I think that when I run out of my stock of Aquadulce and Robin Hood beans that I'll stick with the Extra Precoce Violetto beans. 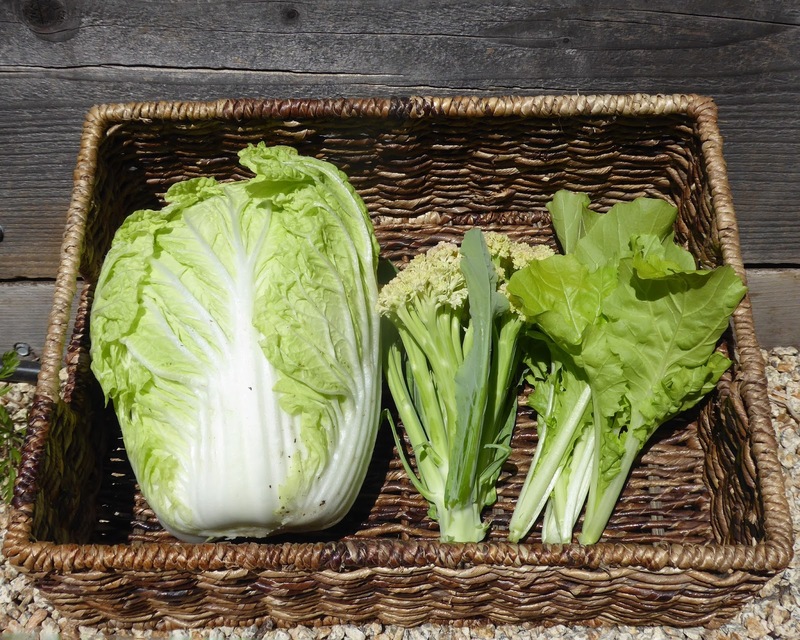 New in the harvest basket last week were a couple of heads of Little Jade napa cabbage. Not quite the babies described on the seed packet, they weighed in at 3.1 and 3.7 pounds. We enjoyed a cabbage slaw with duck confit first and then some Okonomiyaki pancakes. And tonight I'm going to do a cabbage and fava combo dish. I also harvested another small head of Fioretto Stick cauliflower, which now that I go back to read the catalog description is supposed to be small. These turned out to be really good, the heads pull apart easily into long stemmed florets that don't need to be peeled. When blanched the stems turn a pretty bright green which contrasts nicely with the white flower heads, and they are sweet and tender. 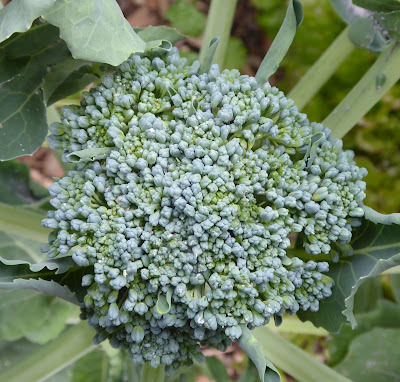 The flavor is less cabbagy than regular cauliflower. I just wish they were more generous with the number of seeds in that pricey packet. The description claims 60 days to harvest and that was pretty accurate, I sowed the seeds on March 26 and harvested the first heads on May 28. The overwintered Batavia broccoli is still putting out side shoots. The Batavia broccoli always surprises me by how productive it is. I thought that it was pretty much done the last time I harvested side shoots but there was nearly another pound of shoots ready to harvest yesterday. 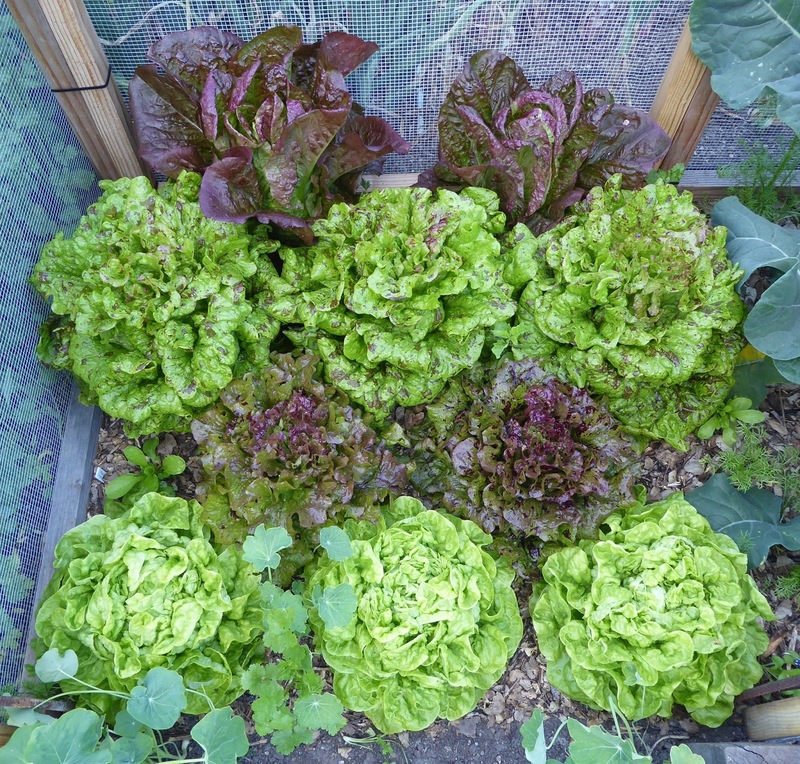 And the baby lettuces keep on giving also, we've been having a generous salad almost every evening lately. 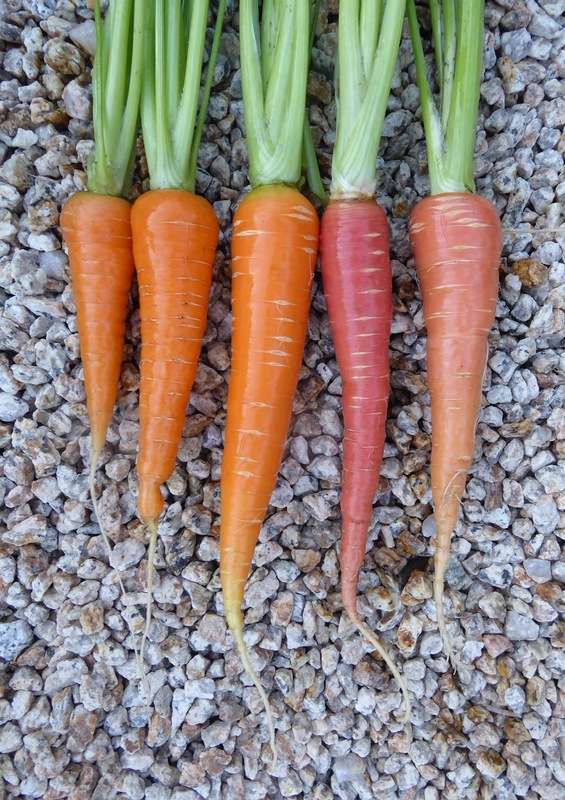 I'm pulling some nice and some funky spring sown carrots. 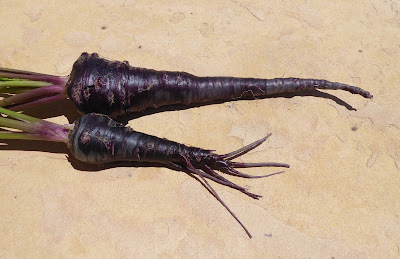 The Black Nebula carrots are a beautiful dark purple nearly all the way to the core, but they do have a tendency to fork and they get hairy roots and they tend to bolt. 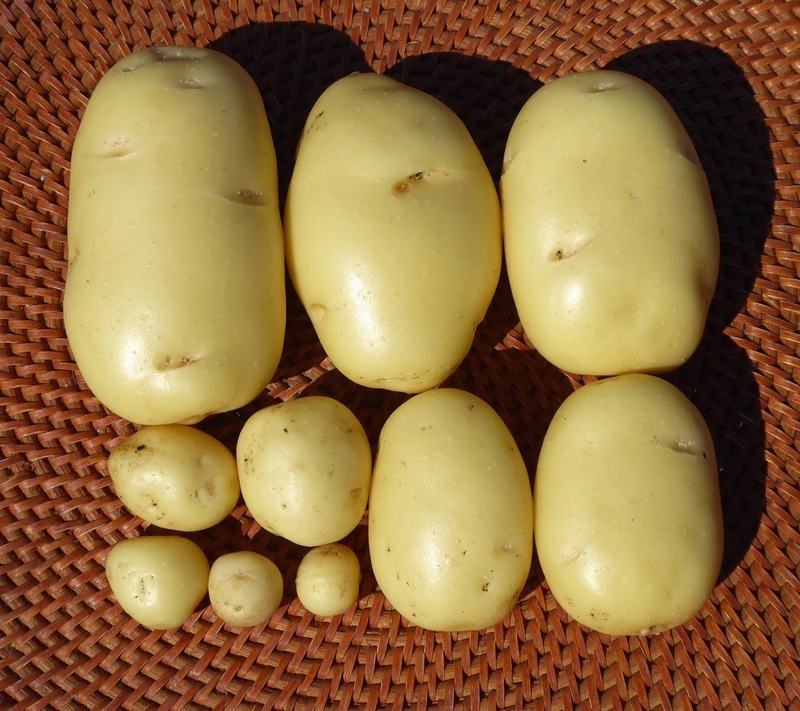 Maybe they will do better when grown in the fall. 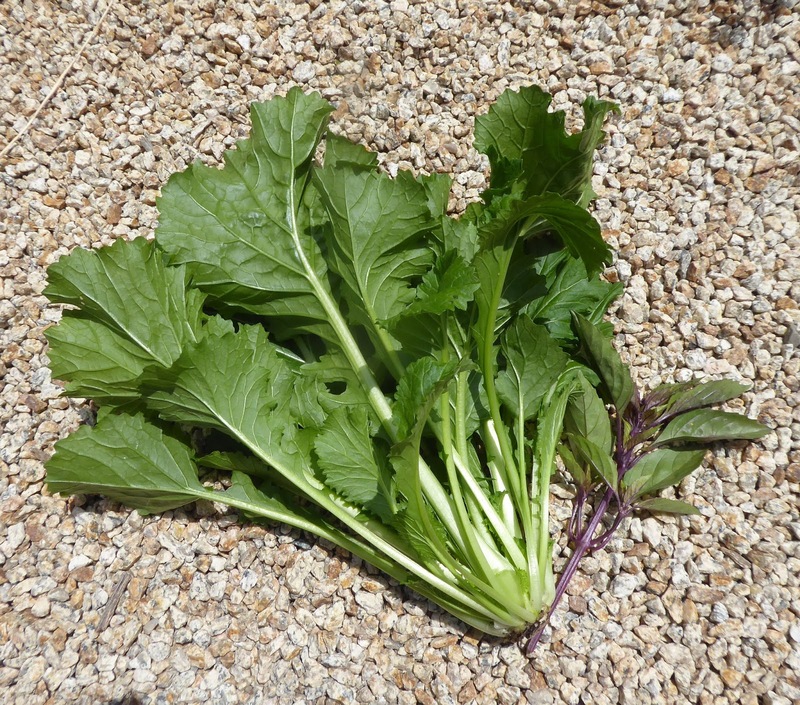 I've been removing the Mizunarubasoi plants to make room for the fast growing Romanesco zucchini. The last couple of harvests have gone into quick soups, one with rice ramen noodles and shrimp, and another without the noodles but shrimp again and some coconut milk. That's a little sprig of Persian basil that I used to season the coconut milk version. I'm liking the Persian basil a lot. I'll have to do a tasting along with the Corsican and Italian Mountain basils and report on that. Also harvested but not photographed was the bolting Ho-Mi Z' mustard which I blanched and froze. And also a few runty Tropea Rossa Tonda onions.